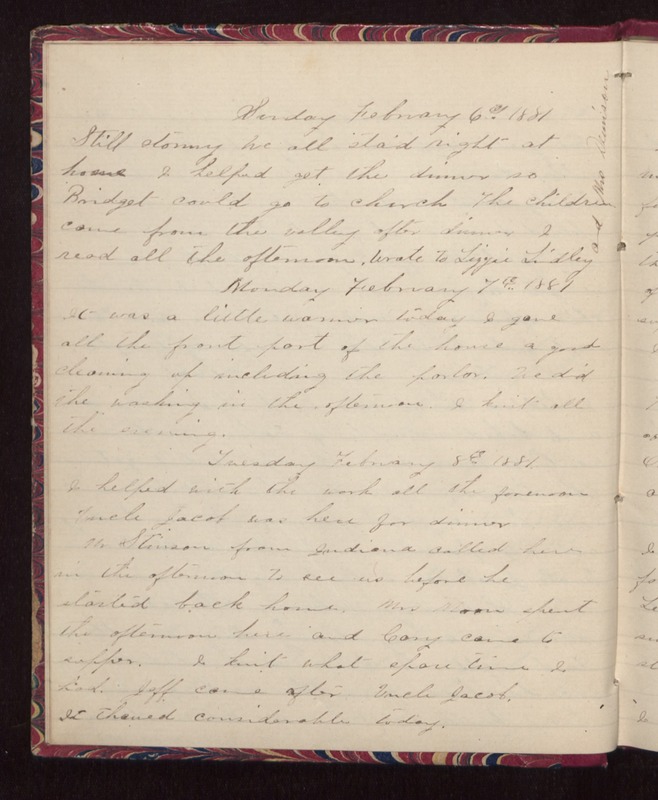 Sunday February 6th 1881 Still stormy. We all staid right at home. I helped get the dinner so Bridget could go to church. The children came from the valley after dinner. I read all the afternoon. Wrote to Lizzie Lindley and Mrs Dennison. Monday February 7th 1881 It was a little warmer today. I gave all the front part of the house a good cleaning up including the parlor. We did the washing in the afternoon. I knit all the evening. Tuesday February 8th 1881 I helped with the work all the forenoon. Uncle Jacob was here for dinner. Mr Stinson from Indiana called here in the afternoon to see us before he started back home. Mrs Moon spent the afternoon here and Cary came to supper. I knit what spare time I had. Jeff came after Uncle Jacob. It thawed considerable today.